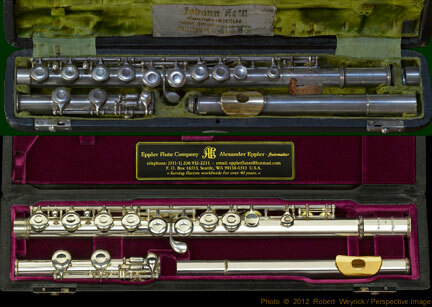 ﻿ Eppler Flute Company. Seattle's leading flute repair and restoration specialist. Alexander Eppler, Flutemaker. Expert flute repair and flute restoration. "Words cannot adequately express how happy I am with my Eppler silver flute and cocuswood headjoint! The tone is warm, smooth, even, pleasing and consistent from low B to high F#4. The keywork is comfortable, solid and secure and the scale makes playing in tune easy. With a dynamic range allowing for full expression and extended techniques such as multiphonics, harmonics and whisper tones so easy to execute, I would play no other instrument. Thanks for making my flute playing life so very much better."